Todays focus is the Rowing WOD. The goal of the workout is to control both stroke rating and pressure. When the stroke rating is low you’ll have to push harder and take longer on the recovery … more ratio. When the stroke rating comes up it should be easier because you can achieve your split with the stroke rating and not pushing as hard, less ratio. Get focused and push it out. The end will be very challenging, so be ready! In the Strength WOD today be sure to practice perfect form in order to translate that power and speed to our rowing stroke. Have fun and let us know how you do! 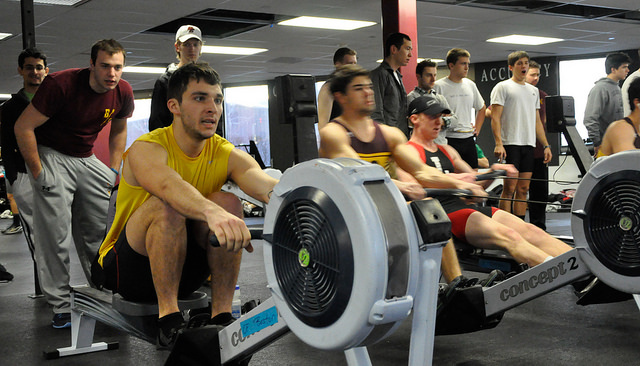 This entry was posted in Fitness, Rowing, Strength and tagged endurance sports, functional movements, mental toughness, recruitment patterns, rowing, sports, training by Renegade Rowing. Bookmark the permalink. Solid Ward! Way to end the week strong!